Jerry Spradlin wasn't much of a high school baseball player. His potential was tapped later, according to The Los Angeles Times, after high school. Helping tap that potential was former major leaguer Clyde Wright, The Times wrote. "He had some ability, but he just didn't have the mechanics to put it all together," Wright told The Times of those early lessons. "He was almost on the clumsy side. But he kept working and working." 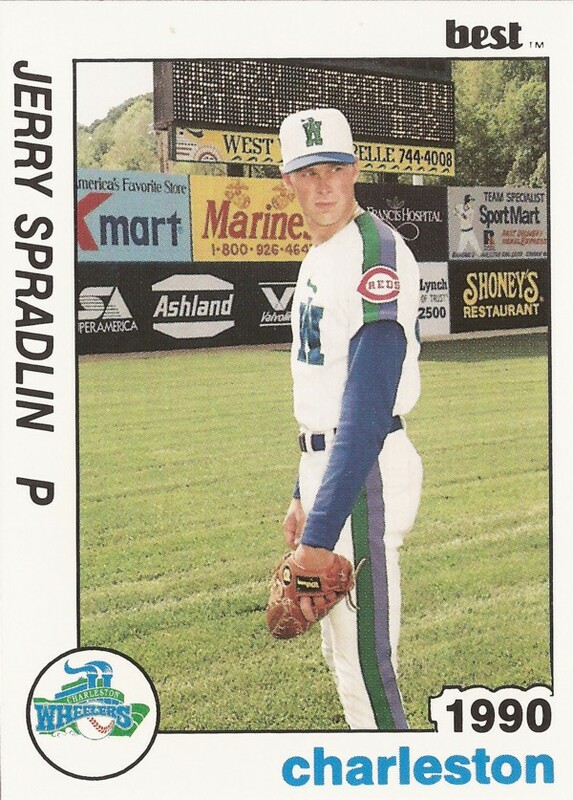 From those early beginnings, though, Spradlin eventually realized that potential, making the majors by 1993 and staying there for parts of seven seasons. And he did so with delivery one opposing hitter later termed as "all arms and legs." Spradlin started that career in 1988, taken by the Reds in the 18th round of the draft, after having played some college ball at Fullerton. Spradlin played that first year at rookie Billings, hitting single-A Greensboro in 1989, then Cedar Rapids and Charleston in 1990. He first made AA in 1991, at Chattanooga, then AAA in 1993, at Indianapolis. It was also in 1993 that Spradlin first made the majors, debuting July 2. Overall that first year, Spradlin got into 37 outings for Cincinnati, posting a 3.49 ERA, even picking up two saves. He returned for six outings in 1994, then just one outing in 1996. For 1997, though, Spradlin signed with the Phillies. He also became a regular. Spradlin got into 76 games for the Phillies in 1997, notching a 4.74 ERA. In 1998, he got into another 69 games, with a 3.53 ERA. In one April 1998 game, though, Spradlin gave up Mark McGwire's 10th home run on the year, a shot that barely cleared the wall. "Spradlin's a difficult pitcher to hit," McGwire told The Philadelphia Inquirer, "because he's all arms and legs." 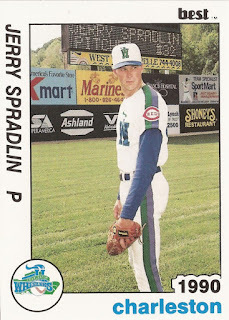 For 1999, Spradlin was traded to the Indians and the Indians were glad to have him. "In Jerry Spradlin we have acquired a strong physical guy with a power arm who could help us in the back end of our bullpen," Indians GM John Hart told reporters after the trade. "Our scouts really like this guy." With the Indians, though, Spradlin only pitched in four games, sent to the Giants in late April in another trade. He played 59 games the rest of the way with San Francisco. Spradlin played in one more major league season, 2000, playing between the Royals and the White Sox. He then finished out his career with several years in the minors and independent ball. With the Royals in 2000, though, Spradlin saved seven games and there was talk of him being the closer. He picked up his fourth save in late May. "I was just trying to do my job, whatever it is," Spradlin told reporters after that fourth save. "I haven't been told I'm the closer. It's bullpen by committee."